Citation Information: J Clin Invest. 2018. https://doi.org/10.1172/JCI120245. Immune nonresponder (INR) HIV-1–infected subjects are characterized by their inability to reconstitute the CD4+ T cell pool after antiretroviral therapy. This is linked to poor clinical outcome. Mechanisms underlying immune reconstitution failure are poorly understood, although, counterintuitively, INRs often have increased frequencies of circulating CD4+ T cells in the cell cycle. While cycling CD4+ T cells from healthy controls and HIV+ patients with restored CD4+ T cell numbers complete cell division in vitro, cycling CD4+ T cells from INRs do not. Here, we show that cells with the phenotype and transcriptional profile of Tregs were enriched among cycling cells in health and in HIV infection. Yet there were diminished frequencies and numbers of Tregs among cycling CD4+ T cells in INRs, and cycling CD4+ T cells from INR subjects displayed transcriptional profiles associated with the impaired development and maintenance of functional Tregs. Flow cytometric assessment of TGF-β activity confirmed the dysfunction of Tregs in INR subjects. 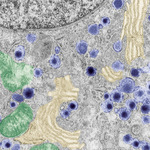 Transcriptional profiling and flow cytometry revealed diminished mitochondrial fitness in Tregs among INRs, and cycling Tregs from INRs had low expression of the mitochondrial biogenesis regulators peroxisome proliferator–activated receptor γ coactivator 1-α (PGC1α) and transcription factor A for mitochondria (TFAM). In vitro exposure to IL-15 allowed cells to complete division, restored the expression of PGC1α and TFAM, and regenerated mitochondrial fitness in the cycling Tregs of INRs. Our data suggest that rescuing mitochondrial function could correct the immune dysfunction characteristic of Tregs in HIV-1–infected subjects who fail to restore CD4+ T cells during antiretroviral therapy. Citation Information: J Clin Invest. 2018. https://doi.org/10.1172/JCI97831. Non-alcoholic fatty liver disease (NAFLD) arises from mitochondrial dysfunction under sustained imbalance between energy intake and expenditure, but the underlying mechanisms controlling mitochondrial respiration have not been entirely understood. Heterotrimeric G proteins converge signals from activated GPCRs, and modulate cell signaling pathways to maintain metabolic homeostasis. Here, we investigated the regulatory role of Gα12 on hepatic lipid metabolism and whole-body energy expenditure in mice. Fasting increased Gα12 level in mouse liver. Gα12 ablation markedly augmented fasting-induced hepatic fat accumulation. cDNA microarray analysis from Gna12 KO liver revealed that Gα12 signaling pathway regulated sirtuin 1 (SIRT1) and PPARα responsible for mitochondrial respiration. Defective induction of SIRT1 upon fasting was observed in the liver of Gna12 KO mice, which was reversed by lentivirus-mediated Gα12 overexpression in hepatocytes. Mechanistically, Gα12 stabilized SIRT1 protein through transcriptional induction of USP22 via HIF-1α increase. Gα12 levels were markedly diminished in liver biopsies from NAFLD patients. Consistently, Gna12 KO mice fed high-fat diet displayed greater susceptibility to diet-induced liver steatosis and obesity due to decrease in energy expenditure. Our results demonstrate that Gα12 regulates SIRT1-dependent mitochondrial respiration through HIF-1α-dependent USP22 induction, identifying Gα12 as an upstream molecule that contributes to the regulation of mitochondrial energy expenditure. Citation Information: J Clin Invest. 2018. https://doi.org/10.1172/JCI93090. Atypical antipsychotics are highly effective antischizophrenic medications but their clinical utility is limited by adverse metabolic sequelae. We investigated whether upregulation of macrophage migration inhibitory factor (MIF) underlies the insulin resistance that develops during treatment with the most commonly prescribed atypical antipsychotic, olanzapine. Olanzapine monotherapy increased BMI and circulating insulin, triglyceride, and MIF concentrations in drug-naive schizophrenic patients with normal MIF expression, but not in genotypic low MIF expressers. Olanzapine administration to mice increased their food intake and hypothalamic MIF expression, which led to activation of the appetite-related AMP-activated protein kinase and Agouti-related protein pathway. Olanzapine also upregulated MIF expression in adipose tissue, which reduced lipolysis and increased lipogenic pathways. Increased plasma lipid concentrations were associated with abnormal fat deposition in liver and skeletal muscle, which are important determinants of insulin resistance. Global MIF-gene deletion protected mice from olanzapine-induced insulin resistance, as did intracerebroventricular injection of neutralizing anti–MIF antibody, supporting the role of increased hypothalamic MIF expression in metabolic dysfunction. These findings uphold the potential pharmacogenomic value of MIF genotype determination and suggest that MIF may be a tractable target for reducing the metabolic side effects of atypical antipsychotic therapy. Citation Information: J Clin Invest. 2018. https://doi.org/10.1172/JCI98353. Adipocyte turnover in adulthood is low, suggesting that the cellular source of new adipocytes, the adipocyte progenitor (AP), resides in a state of relative quiescence. Yet the core transcriptional regulatory circuitry (CRC) responsible for establishing a quiescent state and the physiological significance of AP quiescence are incompletely understood. Here, we integrate transcriptomic data with maps of accessible chromatin in primary APs, implicating the orphan nuclear receptor NR4A1 in AP cell-state regulation. NR4A1 gain and loss of function in APs ex vivo decreased and enhanced adipogenesis, respectively. Adipose tissue of Nr4a1–/– mice demonstrated higher proliferative and adipogenic capacity compared with that of WT mice. Transplantation of Nr4a1–/– APs into the subcutaneous adipose tissue of WT obese recipients improved metrics of glucose homeostasis relative to administration of WT APs. Collectively, these data identify NR4A1 as a previously unrecognized constitutive regulator of AP quiescence and suggest that augmentation of adipose tissue plasticity may attenuate negative metabolic sequelae of obesity. Citation Information: J Clin Invest. 2018. https://doi.org/10.1172/JCI63562. Obesity is a major risk factor for developing nonalcoholic fatty-liver disease (NAFLD). NAFLD is the most common form of chronic liver disease and closely associated with insulin resistance, ultimately leading to cirrhosis and hepatocellular carcinoma. However, knowledge of the intracellular regulators of obesity-linked fatty-liver disease remains incomplete. Here we showed that hepatic Rho-kinase 1 (ROCK1) drives obesity-induced steatosis in mice through stimulation of de novo lipogenesis. Mice lacking ROCK1 in the liver were resistant to diet-induced obesity due to increased energy expenditure and thermogenic gene expression. Constitutive expression of hepatic ROCK1 was sufficient to promote adiposity, insulin resistance, and hepatic lipid accumulation in mice fed a high-fat diet. Correspondingly, liver-specific ROCK1 deletion prevented the development of severe hepatic steatosis and reduced hyperglycemia in obese diabetic (ob/ob) mice. Of pathophysiologic significance, hepatic ROCK1 was markedly up-regulated in humans with fatty-liver disease and correlated with risk factors clustering around NAFLD and insulin resistance. Mechanistically, we found that hepatic ROCK1 suppresses AMPK activity and a ROCK1-AMPK pathway is necessary to mediate cannabinoid-induced lipogenesis in the liver. Furthermore, treatment with metformin, the most widely used anti-diabetes drug, reduced hepatic lipid accumulation by inactivating ROCK1, resulting in activation of AMPK downstream signaling. Taken together, our findings establish a ROCK1-AMPK signaling axis that regulates de novo lipogenesis, providing a unique target for treating obesity-related metabolic disorders such as NAFLD. Citation Information: J Clin Invest. 2018. https://doi.org/10.1172/JCI94307. Sugar- and lipid-derived aldehydes are reactive carbonyl species (RCS) frequently used as surrogate markers of oxidative stress in obesity. A pathogenic role for RCS in metabolic diseases of obesity remains controversial, however, due in part to their highly diffuse and broad reactivity, and to lack of specific RCS-scavenging therapies. Naturally occurring histidine dipeptides (e.g., anserine and carnosine) possess RCS reactivity, but their therapeutic potential in humans is limited by serum carnosinases. Here we present the rational design, characterization and pharmacological evaluation of ‘carnosinol’ (i.e. (2S)-2-(3-amino propanoylamino)-3-(1H-imidazol-5-yl)propanol) a derivative of carnosine with high oral bioavailability that is resistant to carnosinases. Carnosinol displayed a suitable ADMET profile and was determined to have the greatest potency and selectivity toward α,β-unsaturated aldehydes (e.g. 4-hydroxynonenal, HNE, acrolein) among all others so far reported. In rodent models of diet-induced obesity and metabolic syndrome, carnosinol dose-dependently attenuated HNE-adduct formation in liver and skeletal muscle while simultaneously mitigating inflammation, dyslipidemia, insulin resistance, and steatohepatitis. These improvements in metabolic parameters with carnosinol were not due to changes in energy expenditure, physical activity, adiposity or body weight. Collectively, our findings illustrate a pathogenic role for RCS in obesity-related metabolic disorders, and provide validation for a promising new class of carbonyl-scavenging therapeutic compounds rationally derived from carnosine. Citation Information: J Clin Invest. 2018. https://doi.org/10.1172/JCI120912. The M2 isoform of pyruvate kinase (PKM2) is highly expressed in most cancer cells, and has been studied extensively as a driver of oncogenic metabolism. In contrast, the role of PKM2 in nontransformed cells is little studied, and nearly nothing is known of its role, if any, in quiescent cells. We show here that endothelial cells express PKM2 almost exclusively over PKM1. In proliferating endothelial cells, PKM2 is required to suppress p53 and maintain cell cycle progression. In sharp contrast, PKM2 has a strikingly different role in quiescent endothelial cells, where inhibition of PKM2 leads to degeneration of tight junctions and barrier function. Mechanistically, PKM2 regulates barrier function independently of its canonical activity as a pyruvate kinase. Instead, PKM2 suppresses NF-kB and its downstream target, the vascular permeability factor angiopoietin 2. As a consequence, loss of endothelial cell PKM2 in vivo predisposes mice to VEGF-induced vascular leak, and to severe bacteremia and death in response to sepsis. Together, these data demonstrate new roles of PKM2 in quiescent cells, and highlight the need for caution in developing cancer therapies that target PKM2. Citation Information: J Clin Invest. 2018. https://doi.org/10.1172/JCI96138. The glucocorticoid receptor (GR) is a major drug target in inflammatory disease. However, chronic glucocorticoid (GC) treatment leads to disordered energy metabolism, including increased weight gain, adiposity, and hepatosteatosis — all programs modulated by the circadian clock. We demonstrated that while antiinflammatory GC actions were maintained irrespective of dosing time, the liver was significantly more GC sensitive during the day. Temporal segregation of GC action was underpinned by a physical interaction of GR with the circadian transcription factor REVERBa and co-binding with liver-specific hepatocyte nuclear transcription factors (HNFs) on chromatin. REVERBa promoted efficient GR recruitment to chromatin during the day, acting in part by maintaining histone acetylation, with REVERBa-dependent GC responses providing segregation of carbohydrate and lipid metabolism. Importantly, deletion of Reverba inverted circadian liver GC sensitivity and protected mice from hepatosteatosis induced by chronic GC administration. Our results reveal a mechanism by which the circadian clock acts through REVERBa in liver on elements bound by HNF4A/HNF6 to direct GR action on energy metabolism. Citation Information: J Clin Invest. 2018. https://doi.org/10.1172/JCI99217. The t-SNARE protein SNAP23 conventionally functions as a component of the cellular machinery required for intracellular transport vesicle fusion with target membranes and has been implicated in the regulation of fasting glucose levels, BMI, and type 2 diabetes. Surprisingly, we observed that adipocyte-specific KO of SNAP23 in mice resulted in a temporal development of severe generalized lipodystrophy associated with adipose tissue inflammation, insulin resistance, hyperglycemia, liver steatosis, and early death. This resulted from adipocyte cell death associated with an inhibition of macroautophagy and lysosomal degradation of the proapoptotic regulator BAX, with increased BAX activation. BAX colocalized with LC3-positive autophagic vacuoles and was increased upon treatment with lysosome inhibitors. Moreover, BAX deficiency suppressed the lipodystrophic phenotype in the adipocyte-specific SNAP23-KO mice and prevented cell death. In addition, ATG9 deficiency phenocopied SNAP23 deficiency, whereas ATG7 deficiency had no effect on BAX protein levels, BAX activation, or apoptotic cell death. These data demonstrate a role for SNAP23 in the control of macroautophagy and programmed cell death through an ATG9-dependent, but ATG7-independent, pathway regulating BAX protein levels and BAX activation. Citation Information: J Clin Invest. 2018. https://doi.org/10.1172/JCI99397. Prostate cancer is an androgen-dependent disease subject to interactions between the tumor epithelia and its microenvironment. Here, we found epigenetic changes in cancer-associated prostatic fibroblasts (CAF) initiated a cascade of stromal-epithelial interactions. This facilitated lethal prostate cancer growth and development of resistance to androgen signaling deprivation therapy (ADT). We identified that a Ras inhibitor, RASAL3, is epigenetically silenced in human prostatic CAF, leading to oncogenic Ras activity driving macropinocytosis-mediated glutamine synthesis. Interestingly, ADT further promoted RASAL3 epigenetic silencing and glutamine secretion by prostatic fibroblasts. In a orthotopic xenograft model, subsequent inhibition of macropinocytosis and glutamine transport resulted in antitumor effects. Stromal glutamine served as a source of energy through anaplerosis and as a mediator of neuroendocrine differentiation for prostate adenocarcinoma. Antagonizing the uptake of glutamine restored sensitivity to ADT in a castrate resistant xenograft model. In validating these findings, we found that prostate cancer patients on ADT with therapeutic resistance had elevated blood glutamine levels compared to those with therapeutically responsive disease (odds ratio = 7.451, P = 0.02). Identification of epigenetic regulation of RAS activity in prostatic CAF revealed RASAL3 as a sensor for metabolic and neuroendocrine reprogramming in prostate cancer patients failing ADT.